NASHVILLE, TN — The message went out over the weekend. #BlackWomenforTN showed up in emails, texts, on Facebook and Twitter. Phone calls were made. 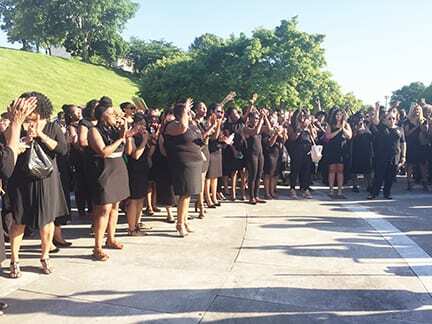 Black women in Middle Tennessee dressed in black needed to gather on the steps behind the Capitol facing Bicentennial Park for a Unity photo on June 6. And over 300 women answered the call from Charlane Oliver, one of the founders of Equity Alliance. They were Generation X-ers, Generation Z-ers, Millenials and Baby Boomers. They dressed in business or evening attire and sometimes athletic gear. Some were using walkers or canes and some were in stilettos. They came with friends and made new friends. Oliver had expected maybe 50 or 100 women to show up. She was more than thrilled when over 300 women turned out. “I’m still on Cloud 9 from what I just witnessed,” she said. The gathering sent a message: “We cannot be denied, overlooked or taken for granted. And neither will our votes,” she said. The Unity photo will be used on an invitation that will soon go out inviting people to attend a brunch on July 14 where four Black women will be honored; two who are pioneers in Tennessee politics and two for their work behind the scenes, Oliver said. She added that Equity Alliance hopes to hold one or two events a month. “We will do things around voter registration, policy agendas, health, economic equality, women-owned businesses and voting rights. Oliver said the non-partisan group wants to focus on getting people out to the polls for the August primary. She pointed out that the group’s work is not exclusive to any racial group. “But charity starts at home. We have to start with us before we can take care of others,” she said. She said Equity Alliance will host Voting is Lit, a community block party near a precinct in Antioch to encourage people to vote. “Research shows that increase voter turnout by as much as 6 percent,” she said.